Mediaplanet’s nursing campaign, found within USA TODAY and online, thanks nurses while inspiring organizations and individuals to invest in the overall well-being of these incredible caregivers. As the Baby Boomer population ages and the number of Americans living with multiple chronic illnesses increases, the need for nurses is greater than ever. 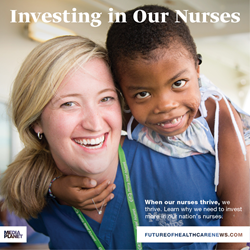 To kick off the celebration of National Nurses Week, Mediaplanet today announces the launch of “Investing in Our Nurses,” a campaign aimed to honor and inspire our nursing community while reinforcing the importance of investing the education, careers and overall well-being of our caregivers. As the Baby Boomer population ages and the number of Americans living with multiple chronic illnesses increases, the need for nurses is greater than ever. As well as working in tandem with doctors to ensure proper medical treatment, nurses are allies, translators, hope-bringers and, quite often, friends. With increased attention paid to education, talented new recruits will learn that the field of nursing is diverse and promising, with a range of career opportunities far beyond the stereotype. The print component of “Investing in Our Nurses” is distributed within today’s edition of USA Today in Dallas, Texas, Chicago, New York and Washington DC/Baltimore markets, with a circulation of approximately 250,000 copies and an estimated readership of 750,000. The digital component is distributed nationally, through a vast social media strategy, and across a network of top news sites and partner outlets. To explore the digital version of this campaign, click here. This campaign was made possible with the support of the American Nurses Association, American Association of Colleges of Nursing, the American Association of Critical-Care Nurses, the DAISY Foundation, Academy of Medical-Surgical Nurses, Congresswoman Bernice Johnson, University of Virginia Medical Center, Jaanuu Medical Wear, Wolters Kluwer, Health eCareers, TRC Healthcare, EHR Tutor, Blessing-Rieman College of Nursing and Health Sciences, Texas A&M University School of Nursing and the University of Texas Medical Branch. Mediaplanet is the leading independent publisher of content marketing campaigns covering a variety of topics and industries such as Health, Education, Lifestyle, Business and Technology, and Corporate Social Responsibility. We turn consumer interest into action by providing readers with motivational editorial, pairing it with relevant advertisers and distributing it within top newspapers and online platforms around the world. Please visit http://www.mediaplanet.com for more on who we are and what we do.